Do you know someone working for the benefit of the Hailsham community or who has committed an outstanding act of bravery or community service? Why not show your appreciation and nominate them for the 2018 Hailsham Town Council Hero Community Award? The Town Council is calling on the people across town to put forward nominations for the award and want you to provide information on someone who achieves great things locally or has gone above and beyond what is expected of them to make things happen. 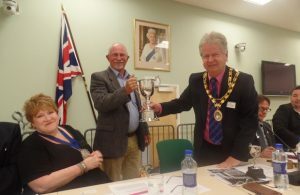 Nominations for next year’s award are being sought following the announcement that Malcolm Richards, founder and trustee of the Hailsham Foodbank project, was presented with the 2017 Hailsham Hero Community Award for his dedication to local residents and passion to help those in need. If you would like to nominate an individual, please use the Town Council’s nomination form to demonstrate that the person has made a significant contribution to the advancement, wellbeing and welfare of the people of Hailsham in a voluntary capacity, demonstrated excellent citizenship, or has committed a one-off act of heroism, selflessness or bravery. For more details or a copy of the nomination form, please visit reception at Hailsham Town Council, Inglenook, Market Street, Hailsham, East Sussex, BN27 2AE or phone 01323 841702, email enquiries@hailsham-tc.gov.uk or download a form here. The deadline for applications has been extended to 4pm on Wednesday 28th February 2018. A panel consisting of town councillors and members of the local community will then select the successful person at a meeting in the spring of 2018. The recipient of the award will be presented with an engraved cup at the Annual Town Meeting being held on 25th April 2018 (time and venue details to be announced).